Everyone's heard of Jimeon, the Irish fella who's managed to worm his way into the hearts and minds of people all over Australia when it comes to comedy. Well this is a DVD of him performing live back in Ireland at the Gaiety Theatre in Dublin. The thing that I like about Jimeoin is that he mixes his delivery perfectly with a combination of physical comedy thrown in for good measure. When he tells a joke, it's as thought he's recounting it for just you alone with a cheeky look on his impish face. 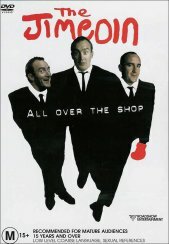 The tales told on "All Over The Shop" will have you in stitches in some places and for the rest of the time, a grin will most definitely be on your face. In fact the only thing that threw me was the title of the DVD. When did he start calling himself The Jimeoin? Possibly that stems from the cover shot which seems to show facets of the one man and combined they are "The". Who cares really, his jokes are funny! The disc offers nothing in the way of extras other than a small biography that isn't going to change the way you look at the DVD format. It's recorded in Dolby Digital 2.0 and only a couple of cameras used in the performance. If that upsets purists though, get over it! This is a great comedy DVD by one of Ireland's funniest exports and it is the humour that makes the title purchase worthy not the way it was filmed. The thing I liked about this feature was that I watched it a number of times and was still laughing at the jokes, which is testament to the delivery and is why I recommend this DVD.